(PhysOrg.com) -- Carbon capture has long been identified as a critical technology needed to prevent global warming, but efficient and economical ways to do it have been hard to find. A new process to capture and convert carbon dioxide, discovered by a chemist in the College of Liberal Arts and Sciences, has just been awarded a patent. It uses cheap catalysts, electricity, and heat to convert CO2 and water into useful chemicals or fuels. 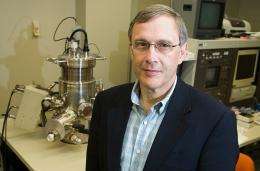 Steve Suib, Board of Trustees Distinguished Professor of Chemistry and the 2011 Connecticut Medal of Science winner, found a way to use metal oxides, such as manganese and zinc oxides, as catalysts in a conversion process that also uses heat and electricity. The newly patented method can be run as a continuous, rather than a batch, process, to yield large amounts of a product. What is made depends on the catalyst used. Potential products include paraformaldehyde, used in disinfectants and in chemical processes in industry, or ethylene, the largest bulk chemical in the world, used in products such as milk bottles. The process could also be used to generate hydrogen and a variety of hydrocarbons. You can make a significant amount of material at high conversions over a long period of time, Suib says. The process was developed in Suibs lab, and Ph.D. candidate Boxun Hu, soon to graduate, was heavily involved in the work, which will be published, Suib says. The patent was granted in late June. It improves on an earlier process that Suib patented in 2009, which used a more expensive catalystplatinumand produced little product. The earlier process was the subject of a 2010 paper in the journal Applied Catalysis Part A. Both patents are jointly held by UConn, through the Office of Technology Commercialization, and Catelectric Advanced Electrocatalysis, a company that began as part of UConns Technology Incubation Program. Catelectric specializes in improved catalysis processes. Suib has received research grants from Catelectric to work on the process. He has also had extensive Department of Energy grant funding, and is the lead researcher on a $1.8 million DoE grant to make catalysts for a pilot biomass conversion plant that will be built at UConn. Suibs latest patenthe has about 50is a combined process and composition of matter patent. While process patents can be hard to enforce, Suib saysit is difficult to tell whether a possible infringer is varying or using the same processthe composition of matter component of the patent makes infringement easier to pinpoint. If the newly patented process is used, UConn would get royalties from the use. The next step would be to take what is a rather crude, laboratory process and scale it up to the pilot plant stage for testing, and eventually to the manufacturing stage, Suib says. The costs of heat and electricity used in the process would then be considerations. Electricity costs are high in Connecticut compared with other states, Suib notes. The technology of capturing heat, and even excess CO2, from existing manufacturing plants might be considered, allowing factories to use their excess heat in a process that would result in making new chemicals. The Buck Rogers idea now being floated is to capture heat escaping from nuclear power plants and use that as a heat source, he says. Before you could even consider this as a plan, you'd need to be using 100% Carbon-free fuels. Then that begs the question of why you'd want to have carbon-based fuels. Because no process is 100% efficient, with existing energy infrastructure your existing coal or natural gas power plant would be making twice or thrice as much carbon as you captured in this way. You're quite literally better off using biofuels, unless your process is powered entirely by wind or solar power. The idea to use waste heat from existing nuke facilities may prove useful, but I doubt it would be economical. After all, that requires you having available space for a refinery near the nuke facility, and it requires pumping stations to move the hot water, and so on. Where are you going to find a nuke facility which conveniently has space for an extra adjacent refinery? Techno1, I believe there is a solar furnace design that converts CO2 to CO which is useful itself as a fuel or can be converted to hydrocarbons. Assuming the fuel would be used, the process would be carbon neutral, or nearly so. It's certainly a better solution than drill baby drill. Not much real information here. How much electricity is needed per mole of product? How much heat and at what temperature. Solar could obviously be used, but would the benefits (CO2 removed) be greater than putting the electricity generated from solar directly into the grid and thus avoiding burning that much more coal? Lot's of questions - few answers. I think that I must be in an alternate universe because I find myself agreeing with Techno1. The second and third laws of thermodynamics, pretty much, relegate this to a process that uses more energy than it produces. Even if you use solar to supply the energy - why not just use the solar directly and avoid the thermodynamic loss? Don't worry Techno1, this is an aberration and we will be back in disagreement soon. If we want to do something with CO2 other than to release it to atmosphere, then it would be logical to use a process that is most efficient. And this looks promising. And if it can be driven (partly) with waste heat, the better. If and when we can find carbon neutral abundant energy source, then we can use that with process like this to scrub CO2 out of atmosphere to reverse the changes we have made with all that fossil fuel burning. If you have a Connecticut Medal of Science,toss it in the trash. If the new process manages to make any money, UConn will get royalties. They don't really say in the above article, how this method compares to other methods in terms of cost per ton of co2. To the best of my knowledge, current methods can use up to a third of a power plant's output (including both direct and indirect costs). It shouldn't be too hard to beat that target, but they don't say here, where this tech sits in that regard. Even if you use solar to supply the energy - why not just use the solar directly and avoid the thermodynamic loss? Same goes for waste heat. If there's enough waste heat to be usefull, then use it to turn a turbine. It's only 'waste heat' when it's not hot enough to be usefull.